Wow indeed. As Eric Sanderson, author of the eye-opening 2009 natural history book Mannahatta, says, “If Mannahatta existed today as it did then, it would be a national park—it would be the crowning glory of American national parks.” More biodiversity per square mile than Yellowstone; more birds than the Great Smokies. Now, in addition to Sanderson’s compelling graphic representations of the primal landscape of this “island of many hills,” we can also revel in an aural taste of what once was. Calling Thunder is a multi-media and VR project put together by a former NPR audio engineer and an NYU School of Visual Arts grad student, and it’s lots of fun to explore. 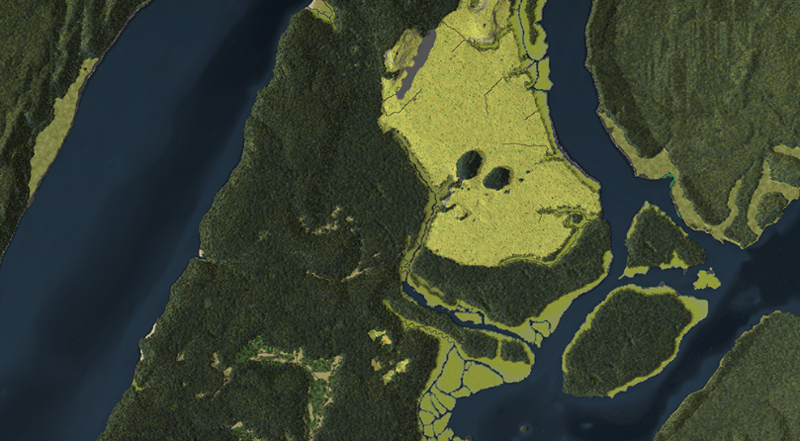 The presentation is centered around an almost ten-minute video (also broken into smaller, location-specific chunks) that takes us through four locations in the modern cityscape and back in time to hear a bit of what these locations sounded like when they were a wilderness of forest, pond, shoreline, and rocky outcrops. Utilizing sounds from Cornell’s Macauley Library of Natural Sounds, each location is also recreated in a longer binaural audio track that lets us go a bit deeper in to these ancient soundscapes. Also check out this recent NYT article to learn more about the project and hear from its creators. It’s actually not all that surprising that this island at the mouth of the Hudson would have been home to such a rich and concentrated profusion of wildlife. That’s what woodlands, marshes, and rivers will do for ya. Next, I’d love to see and hear something like this for the big-city landscape that has most enticed my time-traveller longings: the San Francisco Bay area and Sacramento delta…. 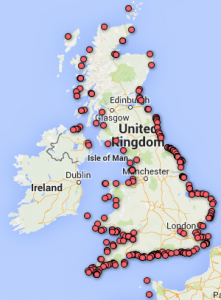 A summer-long project of the British Library and the National Trust, Sounds of Our Shores, has attracted hundreds of submissions from every part of the country. A click on that link will take you to their online collection of sounds, presented in an easy-to-browse format. This recent article from Yorkshire captures some of the enthusiasm that the project has spurred among both the public and the organizers. For National Trust ranger for the Yorkshire Coast, Zoe Frank, the region’s coastline had varied and exciting sounds to offer. She said: “There are so many, but my favourites would include Ravenscar, when, as you walk along the clifftops, you can hear the seals on the beach below. It can be quite an eerie sound, almost like barking.” The “deafening” sounds of kittiwakes during nesting season at Saltburn, and the trickling waterfall at Hayburn Wyke, which runs into the sea just up the coast from Scarborough, also make up some of the “wonderful” natural sounds of the Yorkshire coastline, Ms Frank said. The National Park Service is gearing up for next year’s 50th Anniversary of the Wilderness Act. As part of their celebration, the NPS has just released this wonderful short video highlighting Olympic National Park and its compelling and varied soundscapes. Fittingly, this production is built around Gordon Hempton’s sound archive; the park is his backyard, and he’s spent countless hours over the past few decades reveling in its sounds. This is part of a video series, America’s Wilderness, that’s available on YouTube—subscribe to their channel! And to get a deeper taste of Gordon’s Olympic recordings check him out on iTunes: autumn with elk, cobblestone beach, driftwood log wave resonances, creek from beach to forest. And now for something quite different: two features about creating/composing the sound design for TV sports. At the London Olympics, Dennis Baxtor drew from 4000 microphones, working with 600 sound technicians to sculpt the sound into a more-than-real sonic experience. Alexis Madrigal offers up a good concise overview of his work for The Atlantic, including a couple of compelling examples (catching the flight of arrows in archery, and laying in previously-recorded oar strokes in rowing). And for the middle ground, here’s an extended written piece by the Peregrine Andrews, producer of the BBC show, which includes several audio examples. 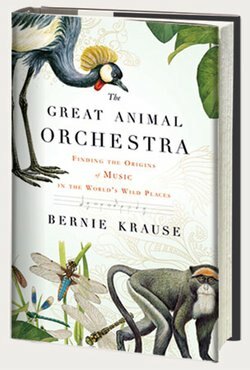 Bernie Krause’s new book, The Great Animal Orchestra, is a worthy culmination to his inquisitive career. After working out a few writerly wrinkles on a couple of earlier books that touched on aspects of his fascination with the world of natural sound, this one offers up a wide-ranging tour of our sounding world, shared in a congenial voice. This book has rightfully garnered widespread praise, including the coveted cover spot on the NY Times Book Review section, as well as write-ups in The Washington Post, The Ecologist, The San Francisco Chronicle, and Wired. Check each of these out for good, brief glimpses into the stories you’ll find between these covers. The Wired piece is particularly well done, with many sound samples; more sounds can be heard on the site of publisher Little Brown. Krause’s reflections on our urbanized relationship to sound are grounded in the soundscape tradition of R. Murray Schaffer, while his continuing efforts to understand the dynamics and relationships in natural soundscapes – using spectrograms to illustrate possible use of acoustic niches (differences in pitch, rhythm, or time of day) that allow a plethora of creatures to each be heard within a complex biophony – are contributions to the leading edges of scientific investigation of soundscape ecology. Many reviewers note the rambling quality of the book as a small downside, but I found that it brought me as a reader into Bernie’s world, where pure wonder at the diversity of sounds crosses paths with speculative theories, sorrow at what’s disappearing, and a commitment to draw us into a deeper communion with the sounding world that surrounds us. A mindful engagement with sounds, or with the world as it is today, will inevitably bring us to such a mix of thoughts, feelings, and inquiries; this book one of the best invitations into the acoustic aspects of our times. David Dunn is a longtime friend and colleague to AEI here in Santa Fe, and in fact his underwater insect recordings were my first taste of the sounds of the natural world having the potential to be deeply strange and amazing, rather than “just” beautiful. So when he discovered that the bark beetles chewing their way through the piñon pines in the hills of New Mexico were making all sorts of bizarre sounds, and suggested publishing a CD to benefit AEI, I was all for it. Since then, the bark beetle inquiry has taken on a life of its own, becoming a perfect expression of David’s longtime conviction that artists can contribute in significant ways to science. The acoustic behavior and communication of bark beetles was previously unstudied by entomologists, and now he’s being called to consult with scientists studying not only the piñon pine beetle, but also the mountain pine beetles ravaging larger higher-elevation and higher-latitude pines, as well as insect pests of the non-beetle persuasion. This past week, a long article appeared in several Canadian newspapers, providing the most detailed look yet at David’s beetle odyssey. It’s an excerpt from a new book by Andrew Nikiforuk, Empire of the Beetle: How Human Folly and a Tiny Bug Are Killing North America’s Great Forests. The article dubs David “the tree whisperer,” though so far he hasn’t quite figured out how to calm the outbreaks; in fact, the research so far seems to be leading more toward driving beetles crazy than calming them. But after forgiving the headline writer, we can sink into he article itself, which is the most detailed, entertaining version yet of David’s beetle adventures. 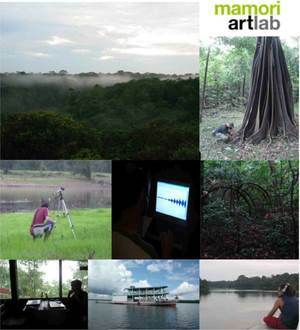 Franciso Lopez’s annual 2-week workshop in the Amazon offers field recordists an amazing opportunity to both explore the rainforest, and collaborate, learn, and create with a community of peers. In recent years, the economic stresses we all feel have made it more difficult for sound artists to raise the funds for this unique experience. This year, there’s a Kickstarter project going, which if successful will fund 6 artists for the trip, and assure that the program continues. If you’re not familiar with Kickstarter, it’s an online platform where entrepreneurs, artists, and others raise funds for worthy projects and product development; in return for your donation, you receive some of the fruits of the enterprise. In this case, recordings! Pledges are made now, and the project only proceeds if they meet their funding goal, at which point your pledge is paid out. For the sixth year, Francisco Lopez is leading a 2-week workshop at Mamori Lake in the Brazilian Amazon. For details, see the workshop webpage. Francisco López, director of “Mamori Sound Project”, is internationally recognized as one of the major figures of the experimental music and sound art scene. Irv Teibel passed away on Oct. 28 in Austin, TX. He was 72, and died of cancer that was diagnosed only a couple weeks before his death. Irv first opened my ears to our living soundscapes in around 1972, when as a teenager I purchased two of his Environments LPs. He released this series under the banner of Syntonic Research Inc. between 1970 and 1979. The series ignited a worldwide interest in field recordings and was an initial entry into the world of carefully recorded natural sounds for both listeners and later recordists. Irv’s family has created a page on the Caring Bridge website that explains the circumstances of his final years, as well as providing a space for folks to leave remembrances. 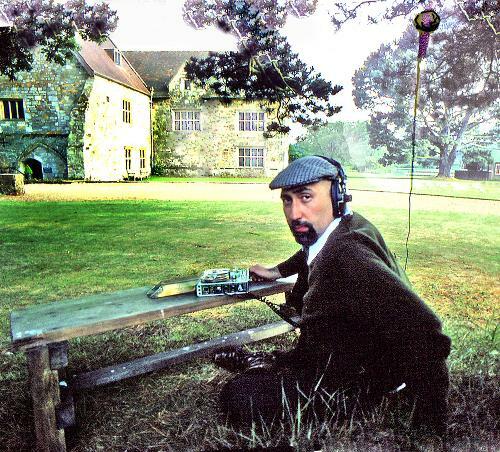 Irv’s work was a precursor to much of what EarthEar and modern environmental sound artists have done, combining state of the art field recording with careful and sensitive studio composition. There’s no doubting that the Environments series, which garnered widespread press coverage and appreciation, was the foundation for all later efforts to create and market compelling field recordings to the general public. For many of us who have continued to care about the health of acoustic habitats and who revel in the complexity and diversity of natural soundscapes, Irv’s work was an aesthetic entry point that affirmed our own passions for listening and honoring the natural world’s rich voice. Thanks, Irv. We were listening! David Abram, whose widely acclaimed first book, The Spell of the Sensuous, addressed the mixed legacy of the written word in our culture, has released a new one, Becoming Animal, which draws on another decade of deep experience with the human and more-than-human world. While the first book was his Ph.D. project, and veered deeply into academic phenomenology in an effort to contribute some fresh ideas in that field, the new one is much more rooted in David’s stellar storytelling voice. David’s always been a strong advocate for my work with acoustic ecology, as his vision has much in common with our intention to listen more clearly to the voices around us. Learn more about Becoming Animal: An Earthly Cosmology on David’s Alliance for Wild Ethics website; there are a few short videos there as well, providing a quick taste of his uniquely engaged mind and heart. July 18 was chosen as the date for World Listening Day because it is the birthday of the Canadian composer R. Murray Schafer. Schafer is one of the founders of the Acoustic Ecology movement. The World Soundscape Project, which he directed, is an important organization which has inspired a lot of activity in this field, and his book Soundscape: The Tuning of the World helped to define many of the terms and background behind the acoustic ecology movement. The American Society for Acoustic Ecology is pleased to announce ASAE Chicago: Listening for the Future. This is the first-ever national gathering of the ASAE membership and the general public. Hosted by the Midwest Society for Acoustic Ecology and the World Listening Project, Listening for the Future will take place from July 9-11, 2010. We think it’s going to be a fantastic three days, with plenty of information and inspiration to go around. We hope you will join us at this landmark event. Additional details will be posted on the Listening for the Future web page. Please bookmark and check back often as we’ll be making frequent updates from here forward. A registration page will be posted early next week, along with locations of all venues, maps, schedules etc. Featured speakers at this year’s workshop are “The Sound Tracker,” Gordon Hempton, Emmy award-winning nature recordist and author of One Square Inch of Silence and the subject of a new documentary film, Soundtracker, by Nick Sherman. Hempton and Sherman will present the film at the workshop. The program also includes John Muir Laws, illustrator, naturalist and teacher, author of The Field Guide to the Sierra Nevada and the new Laws Pocket Guide; director Gina Farr of Farr Visions and the creator of Wild Sound Stories; and Dan Dugan, renowned sound designer. Each guest has a unique point of view of the natural world and vividly expresses him or herself through art, environmental activism and education. As an additional option, participants may choose to take an overnight backpack on Sunday June 27th to a recording location free from mechanical sound, organized by Steve Sergeant of the Sierra Club. The “early bird” (prior to June 1) cost of the workshop is $175 for NSS members, $200 for non-members, and includes a one-year NSS membership. After June 1, the cost is $200 for NSS members and $225 for non-members. Lodging in tent cabins and meals are included. The optional Sunday night backpacking expedition will be an additional cost. The latest podcast from Touch Music, a British label that’s been the source of many of the best soundscape releases over the past decade, is a wonderful 45-minute radio documentary style piece from Chris Watson, who recently spent time in Antarctica. The Disquiet blog has a nice introductory post and embedded audio, so go there to listen to Chris share his experiences in words and sounds. His narrative descriptions of landscape and his travels (including flying into the south pole), and of course his stellar recordings of penguins, seals, and creaking ice, are well worth spending an hour with! It seems that hooking a grant-ride on the Antarctic Express has become quite the rite of passage for many sound artists in recent years. Doug Quin was among the first, going down in 1996 and again in 1999 to be there at the turn of the millennium. More recently, Craig Vear, from the UK, created the most elaborate artistic response to the place with his DVD, CD, and book Antarctica: Musical Images from the Frozen Continent, which features compelling imagery, historic films, and a half-hour audio-video piece combining field recordings and spoken remembrances from Antarctic scientists. Very cool collection of various approaches to sound mapping, recently posted at Weird Vibrations. Here’s the first post, sharing their overview of several sound mapping models, including collaborative documentary, composition, preservation, and policy-oriented. And here’s a follow-up post of others sent in by readers. And to go one step further, here’s a delicious link from a commenter, to his own collection of sound maps. And, oh, what the heck: here’s the current list of sound maps from AEI’s main site! Well-known cartoonist Lynda Barry lives in rural Wisconsin, and while her home is not in the midst of a wind farm, she has become a leader of local resistance, with a focus on the noise that keeps people awake, and strange physcial sensations, including one that she herself experiences when near operating turbines. “You know how sometimes, around your eye, you’ll get this little tic that kind of wiggles?” says Barry. “It was like having that in your ear and your chest. A pulsing. It’s the weirdest feeling!” She experienced this while visiting a home 1100 feet from the nearest turbine, one of many homes she’s visited and spent the night in as she has worked to understand what some wind farm neighbors are living with. Her work is highlighted in a recent feature article in Isthmus, a Madison weekly, which is illustrated with a classic-style Barry cartoon in which each panel highlights a different neighbor’s story. Animals Finally Respond to Music: It Just Has to be Written for Their Species! Fascinating discovery of the day: music written for monkeys, based on their vocalizations, finally triggers a notable response. What follows is straight from the website of the composer, who also makes music for cats. You can hear an NPR story on the monkey research here. Many previous experiments on animal response to music composed for humans (hereinafter, “human music”) have been conducted, but none of these studies had demonstrated significant responses. Very recently a study of the effect of human music on cotton-topped tamarin monkeys was conducted at Harvard. The tamarins showed a slight preference for Mozart over German “techno” music, but preferred silence to either. This study was consistent with the findings of all previous studies: animals are largely indifferent to human music. We performed tests at the University of Wisconsin on the same species of tamarins. As with all previous studies, the tamarins showed a lack of interest in the human music. By contrast, the effect on them of the species-specific music composed by David Teie was remarkably clear and convincing. They displayed a marked increase of activity in response to the music that was designed to excite them, while the “tamarin ballad” music induced a significant calming. This calming effect was measured against the baseline of silence; they moved and vocalized less and orientated more toward the audio speakers during and immediately following the playing of the tamarin ballad. Fairbanks-based John Luther Adams is likely the most place-based composer of his generation. His music for orchestra, small ensembles, percussion, and electronics is music of the wild north, not merely from Alaska but seemingly drawn forth from the land, people, animals, and sky. From explicit works like Earth and the Great Weather, with its incantations of native place and animal names, to subtler pieces such as In the White Silence, Adams has created a musical vernacular that is all his own, in service of knowing and expressing the land that seems to absorb him into its own deep rhythms. The New Yorker carried a wonderful extended profile of him last year, and now Wesleyan University Press has released his second book, which invites us into his creative process during the design of a permanent installation at the Museum of the North. In a long, slightly curved room, Adams and his collaborators created a space in which the earth and sky outside “compose” an eternal musical reverie. 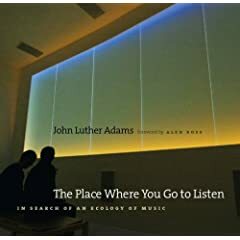 Drawing on his decades of cultivating a musical voice that utilizes long, slow changes, carefully considered intervals, and percussion, Adams programmed electronics that transform various aspects of the surrounding environment into musical gestures, which together sing a song of this place. In short, widely ranging diary entries, The Place Where You Go to Listen invites us into the two-year process of pondering, and then realizing, this grand expression of his compositional vision. The Choirs of Day and Night: Pitch and amplitude of parts of the music respond to the presence and height in the sky of the sun, including deep tones when it is below the horizon. Meanwhile, the moon triggers its own choral textures; of course, at times they share the sky, and the room, and at times they are absent, while the extent of cloud cover also colors these tones. Earth Drums: Seismic data from five other places in Alaska trigger virtual drums in The Place: “During moderate to large earthquakes, low-frequency sounds rumble and boom through the space as different stations receive the seismic vibrations at different times and intensities.” Smaller seismic events, imperceptible to humans, also trigger the Earth Drums in a more transient, localized way; the distance to the mini-quakes, as well as the three-dimensional movement of seismic waves, alter specific aspects of the sounds. Most importantly, though, his words—and his compositions—do far more than invite us into his world. They also point toward ways that we each might experience more fully the places where we go to listen. And for this we can thank him for his generosity in sharing his own difficult yet rewarding exploration into his work, and our world.